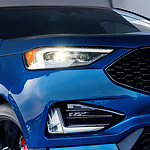 Many drivers have been talking about the Ford Edge ST. It’s the premium model that has made many people see the difference in Ford’s latest lineup. The Ford Edge is a comfortable ride, but it doesn’t have the power of the Ford Edge ST. This is an upgraded SUV that’s meant to explore the road and do some off-roading too. That’s due to the powerful twin-turbocharged engines. With a V6 engine, you can do practically anything in this SUV and take it anywhere. The Edge ST has a twin-turbocharged V6 engine that can put out 245 horsepower and 380 pound-feet of torque. Inside, you’ll find a quiet, comfortable ride that handles well and gives you everything you need in terms of amenities. For example, you can easily adjust the sound based on where you are in the vehicle so that it works better, and you can connect to your smartphones to use Apple CarPlay or Android Auto. Want to test drive the latest Ford Edge ST? Stop by Ulrich Ford Lincoln located in Pella.